Inform the HMI that SDL is ready to be terminated by the system. OnSDLClose notification is sent by SDL to notify the HMI that SDL has terminated all activity, saved/cleaned up necessary data, unregistered all applications, and the SDL Core process is ready to be closed by the system. Notify SDL about an intention to terminate because of Ignition Off, Master Reset, or Factory Reset via OnExitAllApplications. 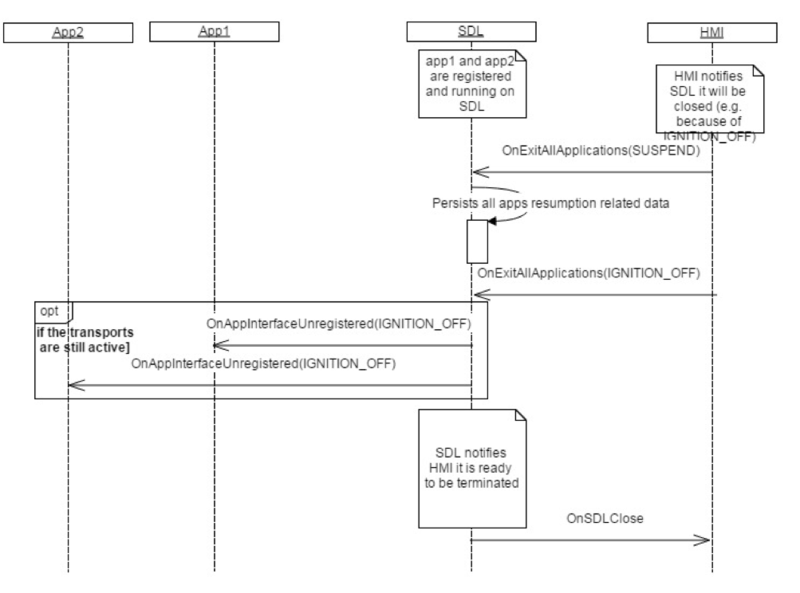 Terminate the SDL process only after receiving OnSDLClose. Otherwise, application data may be lost. SDL unregisters applications if the transports are still availble after an Ignition Off. SDL cleans up applications' persistent data if the HMI calls for a Factory Reset or Master Reset via OnExitAllApplications.